The Ram 1500 is tough and capable light-duty truck with comfortable nature thanks to independent front suspension and rear coil springs. Other its qualities are great trio of engines, quiet and well-equipped interiors, easy to use infotainment system, and so on. All these qualify it to be the closest rival to the best-selling Ford F-150 together with Chevy’s Silverado 1500. 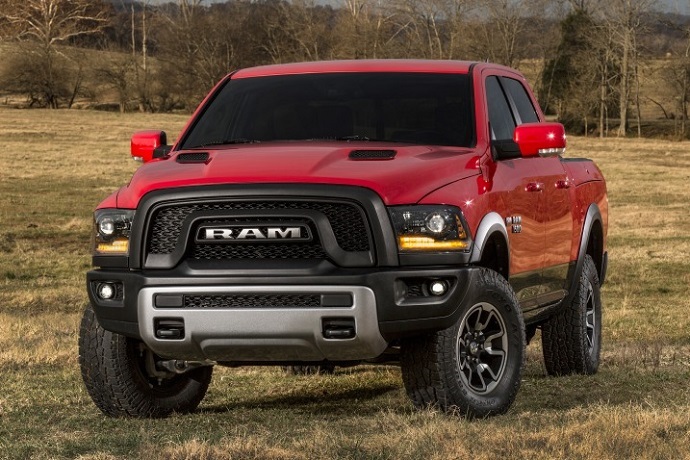 What also makes this truck modern and good is also wide range of available configurations and among them you can find off-road oriented version 2017 Ram 1500 Rebel Crew Cab. Is there something new for 2017? The Ram 1500 hasn’t been changed much for the 2017 model year. What is new is that it drops the Outdoorsman trim and mixes some features. It also eliminates a 6-speed automatic transmission from offer. But let’s return to the Rebel version! What divides the 2017 Ram 1500 Rebel Crew Cab from the rest of the lineup is its off-road hardware and unique styling and interior. This model has overall the same shape as other versions but unique details and trims inserts makes it unique. The dominating difference on this model is unique grille which is also present on the Limited version and it has design that replaces signature crosshair theme for controversial design with large RAM lettering in the middle which is also present on the tailgate of this model. The Rebel also has different hood with two scoops and other unique elements are black fender flares, a 17-inch wheels with all terrain tires, LED fog lights, tow hooks, underbody protection, etc. Interior of this model features the same arrangement like other versions but with some unique trim inserts. Like other models it includes excellent and supportive seats and many standard and alternative storage compartments. Inside the cabin, great build quality is obvious and high-quality materials have been used. Infotainment system is easy to use and understand and it comes with an 8.4 inch center screen and other modern connectivity and integration options. The Rebel version is only available in crew cab body style which comes with four conventional doors and bed length on this model is 5 foot 7 inches. Some features that this model includes are 17-inch wheels, all terrain tires, LED fog lights, tow hooks, keyless entry, tilt and telescopic steering wheel, power adjustable pedals, seven speaker sound system, Uconnect infotainments system, six-way adjustable passenger seat, unique upholstery, heated steering wheel and front seats, etc. For off-road duties it also includes performance gearing, a limited slip differential, and front and rear Blistein shock absorbers. The 2017 Ram 1500 Rebel Crew Cab comes with two engine options. It is also available in rear and all-wheel drive configuration which can be demanded as either part time with manual mode selection or with auto selection. In both cases 4WD comes with two-speed transfer case and low range gearing. An eight speed auto gearbox is standard. Standard engine on the Rebel is a 3.6 liter V-6 gasoline which can produce 305 hp and peak torque of 269 pound-feet. Fuel economy with this engine is around 20 mpg combined and max towing is 7, 610 pounds. An optional is 5.7 liter V-8 engine can produce 395 hp and torque of 410 lb-ft. It returns fuel economy of 17 mpg combined. The V-8 can tow up to 10, 640 pounds. The 2017 Ram 1500 Rebel Crew Cab with four wheel drive and 3.6 liter engine is priced at $47, 095. With rear wheel drive and a 5.7 liter engine it is available for $44, 995.